Today's doll's condition is a bit rough, but I had never seen one before. I thought those of you who hadn't either might be interested. She's this girl. She's one of the Starlight Girls,from the Jem line. They were made in 1987, as if you can't tell from this picture! They were made by Hasbro. There were three Starlight Girls: Ashley, Krissie, and Ba Nee. The other Starlight Girls, Krissie ,and Ba Nee,with Ashley. 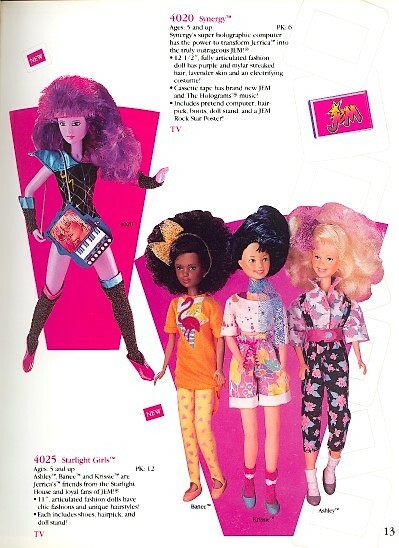 As I said.the Starlight Girls were part of the Jem line. The girls were the foster kids of Jerrica Benson,otherwise known as Jem. Unlike Jem and friends,who are pretty large,The Starlight Girls are only 11" tall. They have click bend knees and twist waists. And very pronounced belly buttons, years before the controversy over Barbie's belly button. She also has pronounced neck bones. Ashley has a fair amount of damage to her face, but I had never seen or heard of her before I found this girl at Goodwill last week. I thought maybe there might be others who hadn't heard of her, who might find her interesting. When I found her I thought she resembled the Jem dolls,or maybe she might have even been Maxie's younger sister,(Even though I don't think Maxie had a sister,but Ashley is slightly shorter than Maxie.). Both Jem and Maxie are by Hasbro, so I guess there's a 'family' resemblance. You can see a good page with lots of information on the Jem line HERE. In spite of her damages, she has a cute little face. It's too bad that, from the looks of her, she has been chewed, .